The Downers Grove Police Department reminds you to "Buckle-Up Your Valentine" during the holiday and throughout the year. Valentine's Day is about showing the ones you love how much you care about them. One easy way you can demonstrate your love is to buckle up and insist that everyone you love does the same anytime they are riding in a motor vehicle. Unrestrained or improperly restrained children riding in a motor vehicle are twice as likely to die or be severely injured in a crash. The single most important thing you can do to protect your children is to buckle them up properly, every trip, every time. Make sure your child safety seat is the right fit for your child and your vehicle. Downers Grove residents that need assistance installing their child safety seat can call Supervisor Tim Sembach at (630) 434-5636 to schedule an appointment with a certified child safety seat technician. 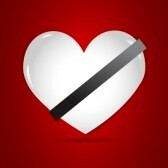 On Valentines Day, and everyday – Buckle-Up Your Valentine.